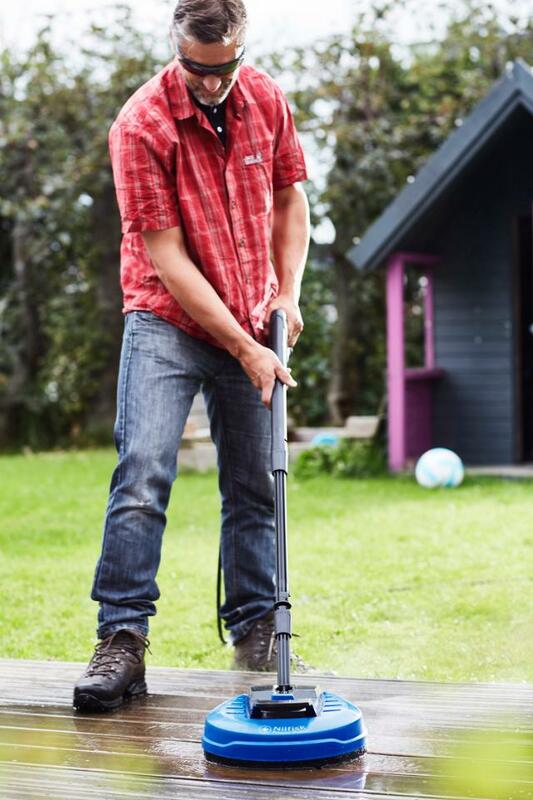 Nilfisk has just released a new cleaning accessory attachable to their high pressure washers. It’s called the Power Patio and with good reason. The Patio cleaner offers households faster cleaning of outdoor surfaces while being gentle to the surface at the same time. Outdoor surfaces tend to get covered by dirt and debris unless taken care of. It is a tedious chore you want to finish as soon as possible. With the new Nilfisk Power Patio you get to enjoy the outdoor pleasures sooner. The Power Patio comes with specially designed nozzles and the largest efficient size promising up to 20% higher speed than comparable cleaners. Your outdoor areas may have different surfaces like wood, stone, bricks or even concrete. Using a high pressure washer alone on these may be too hard and damaging. However, you don’t need to worry as the Nilfisk Power Patio is dedicated to gentle cleaning. The Power Patios comes with a power regulation so you can effectively reduce the cleaning power to match for example a soft wooden terrace. You get in control and don’t need to worry about marks or stripes when done. Occasionally, your challenge is different. You may find areas with really engrained dirt. 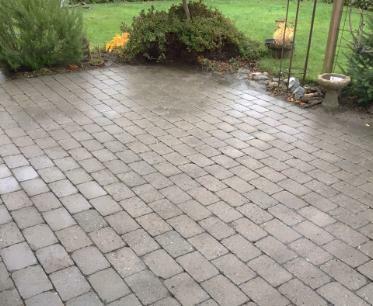 For such areas the Power Patio offers Dirt Hammer nozzles with an extra hard cleaning power. You can switch between the general nozzles and the Dirt Hammer nozzle as you please. In this way you will soon remove the dirt and discover a remarkable result. Use of detergents makes cleaning even more quicker and easier. When finished rinse of the loosened dirt. 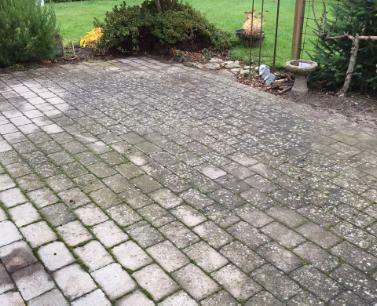 Consider applying a protective coat to the cleaned surface for a sustained great result. Now you are ready to relax and enjoy the sun. Its trolley is designed for easy storage of all standard accessories. With the Click&Clean system it is quick and easy to change nozzles, and the standard Nilfisk bayonet coupling ensures compatibility to the large range of Nilfisk accessories. With the Click&Clean system it is quick and easy to change nozzles, and the standard Nilfisk bayonet coupling ensures compatibility to the large range of Nilfisk accessory. The C 130.1 is a sturdy design and less noisy. It offers good cleaning performance and is suited for moderate to tough dirt. This machine has a number of functions that cover basic cleaning needs and convenient features like trolley, hose reel on X-TRA models, storage of nozzles, lance and spray handle on the machine. The C 100.6 models are ideal for typical domestic cleaning tasks like cleaning of flagstones, stairways, vehicles with a moderate use. Furthermore, when you buy a C 100.6 it is almost ready for use - you only have to attach the hose. The C 105.6 models are ideal for typical domestic cleaning tasks like cleaning of flagstones, stairways, vehicles with a moderate use. Furthermore, when you buy a C 105.6 it is almost ready for use - you only have to attach the hose. The C 110.4 is perfect for typical domestic cleaning tasks like cleaning of flagstones, stairways, vehicles with a light to moderate use. The C 120.6 is for typical domestic cleaning tasks like cleaning of flagstones, stairways, vehicles with a moderate use. The E 130.3 is very mobile, due to the upright and ergonomic design and the extra handle for lifting and the build in telescopic handle makes it easy to store away as a compact unit. The storage options also include storage of Click&Clean e.g. C&C auto brush or a rotary brush. The height of the products ensure good ergonomy. The C&C nozzle system makes it quick and easy to change the nozzles. The standard Nilfisk bayonet coupling ensures compatibility to the large consumer accessories range. It is standard with a reliable and long lasting induction motor. It can be stored and used as a stationary solution on the wall by separate wall-hook. The E 130.3 X-TRA models are very mobile and user-friendly due to the upright and ergonomic design and the on-board hose reel. The build-in telescopic handle make these machines easy to store when not in use. The storage options also include storage of Click&Clean accessories, such as C&C auto brush or a rotary brush. The C&C nozzle system, which is a unique feature for Nilfisk pressure washers, makes it quick and easy to change the nozzles. The standard Nilfisk bayonet coupling ensures compatibility to the wide Nilfisk consumer accessory range. The E 145.3 X-TRA models are very mobile and user-friendly due to the upright and ergonomic design and the on-board hose reel. The build-in telescopic handle make these machines easy to store when not in use. The storage options also include storage of Click&Clean accessories, such as C&C auto brush or a rotary brush. The C&C nozzle system, which is a unique feature for Nilfisk pressure washers, makes it quick and easy to change the nozzles. The standard Nilfisk bayonet coupling ensures compatibility to the wide Nilfisk consumer accessory range. The E 150.1 is a domestic pressure washer with a performance matching that of semiprofessional machines. The Nilfisk bayonet coupling ensures compatibility to the large Nilfisk accessories.